and four touchdowns against a tough West Chester defense. The senior currently leads the PSAC with 20 touchdowns. When discussing the West Chester football team around the Bloomsburg Football team before their Saturday matchup some words came to mind. Undefeated, because they racked up seven straight wins over a tough PSAC conference. 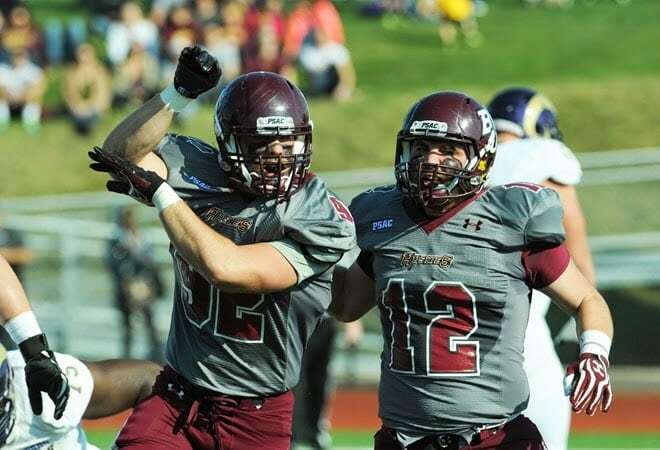 Balanced, because of their top ranked offense, and second ranked defense in the PSAC East. Mostly though, you will hear the word revenge, as the Rams ended the 2013 PSAC Champions’ season in the playoffs, and were at home. The story was different on Saturday, as the beautiful afternoon provided an outlet for the Huskies to get their revenge, in a 41-10 blowout that put them in first place in the conference, and put them in the driver’s seat to earn home-field advantage in the playoffs. The game also saw a standing room only crowd, as 7,300-plus people packed Redman Stadium in one of the more anticipated regular season games in a while. Running back Eddie Mateo had the game of his life, in the most crucial spot, as the senior ran for a career-high 269 yards, and four touchdowns. 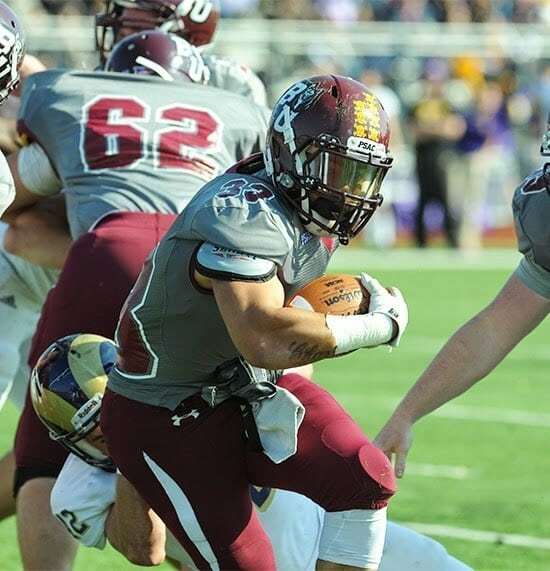 Mateo now leads the PSAC with 20 touchdowns on the 2014 season. Backup running back Dai’Shon Munger also had his best game of the season, running for 143 yards., which is a season high for the junior. defense in the PSAC, only letting up 13.8 points-per-game. Defensively, safety Jerrin Toomey had a career game as well, picking off West Chester quarterback Sean McCartney three times, while recording a pass breakup and two tackles. Justin Shirk had his usual game, compiling 11 tackles, one-and-a-half tackles for loss, and half a sack. Safety Tomas Cabrera was all over the field with eight tackles, a forced fumble, and an interception at the end of the first half. Finally senior cornerback DJ Robinson continued his solid play this season, with four tackles, one for loss, and a big fumble recovery on the Rams opening drive of the game. Overall the Huskies were plus-six in the turnover battle, which has been the bread-and-butter of the defense all year. 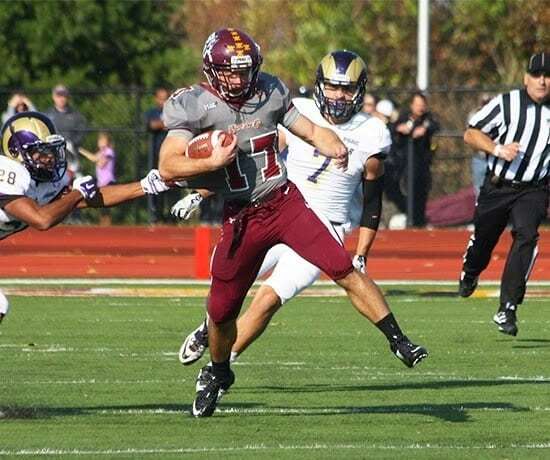 The game could not have started any better for Bloomsburg, as Cabrera forced a West Chester fumble in Rams West Chester territory on the opening drive of the game. Six plays later Mateo found the end zone for the first time on a four-yard rush to make the score 7-0. Later in the quarter, Bloomsburg set up shop at their own 12twelve yard line. Mateo started out the drive with a 56-yard scamper, and four plays later he found a hole and ran 12-yards into the end zone for his second score of the day. On the drive, Mateo became just the eigth Husky to rush for 3,000 career yards. After the score, the Huskies were up 14-0, and would end the quarter with the same score. BU’s first drive of the second quarter saw them march 55-yards on six plays, which set up a Brayden Drexler field goal attempt from 25 yards out which he put through the uprights. Drexler’s three put the Huskies up 17-0 with 10:41 seconds left in the second quarter. After Toomey’s first interception the Huskies started out at their own 15-yard line, and after a six-play drive Mateo ran for his third touchdown of the half on an elusive 21-yard run. Mateo’s score gave BU a commanding 24-3 lead, thatlead that they would take into the half. Following a missed field goal from West Chester on their opening drive the Huskies embarked on their own drive that started at the 50-yard line. The march featured the running game of Mateo and Munger on a combined five carries for 48 yards. Quarterback Tim Kelly finished off the drive with a 21-yard touchdown pass to receiver Connor Gades. The score put the Huskies over 30 points for the sixth straight game, as the lead grew to 31-3 with just over eight minutes left in the third quarter. Golden Rams, recording three interceptions and two tackles. West Chester did get their first touchdown, as McCartney found his receiver Shannon Mayer in the corner of the end zone, to shorten the Husky lead to 24 points at 34-10, with under a minute to go in the third quarter. Mateo finished off the scoring in the game with a thunderous 59-yard run, which was his longest of the day for either team. After the Bethlehem natives run, the score was 41-10 Bloomsburg at the 10:41 mark and the game would end that way. The challenges will not end for the Huskies, as they are trying to repeat as champions of the PSAC East. This week they will host division-rival East Stroudsburg who isare 6-2, and are coming off a surprising loss to Kutztown by a score of 31-16. ESU has a powerful offense, but their record-setting quarterback Matt Soltes may be out with a shoulder injury thathe oincurred against Kutztown. The game will have a 2:00 p.m. kickoff.